After a quick stay in the liberal college town of Missoula, MT, we headed towards Yellowstone National Park. I feel a little embarrassed to say that, besides Old Faithful, I didn't really know what goes on at Yellowstone. I wasn't even very sure where exactly it was until I looked at a map. Fortunately, our lack of knowledge made exploring the first established national park in the world a really fantastic experience. For those of you who are in the same "I know what Yellowstone is, but I really have no idea" boat, here's a quick run-down. 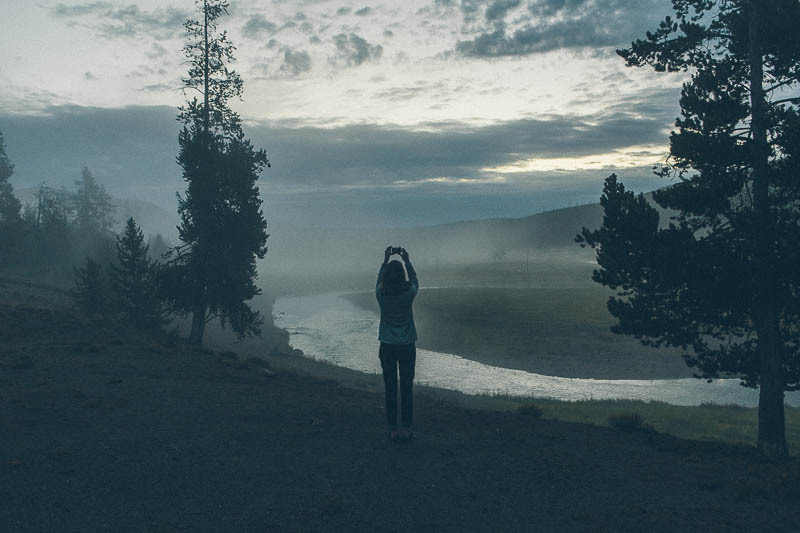 Yellowstone National Park was established by Ulysses S. Grant in 1872, making it the first national park, not just in the United States, but in the whole world. It's located in northwestern Wyoming, with parts extending into Idaho and Montana. 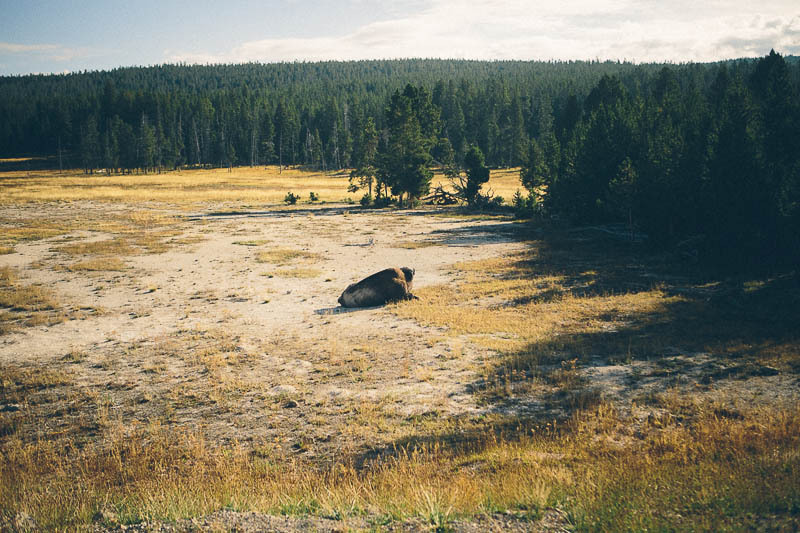 Yellowstone is known for its geothermal activity (including geysers and hot springs) and wildlife (buffalo, elk and bears). 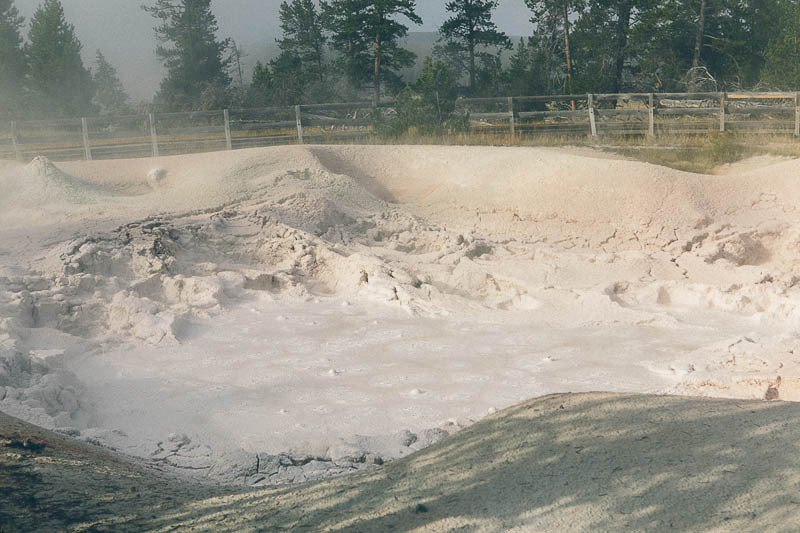 The park is also situated over the Yellowstone Caldera, which is the largest supervolcano on the continent! It's still active, but there isn't much of a chance that it'll blow anytime soon. We arrived at Baker's Hole Campground, just north of West Yellowstone, MT (the closest town outside of the park). For $20 a night (including electric hookups), we had a beautiful forested campsite only three miles from the park entrance. It would have been convenient to stay inside the park, but all the campsites were booked and most didn't provide any hookups. It was warm and mid-afternoon by the time we finished setting up camp, so we decided to head into the park to find ourselves a swimming hole. 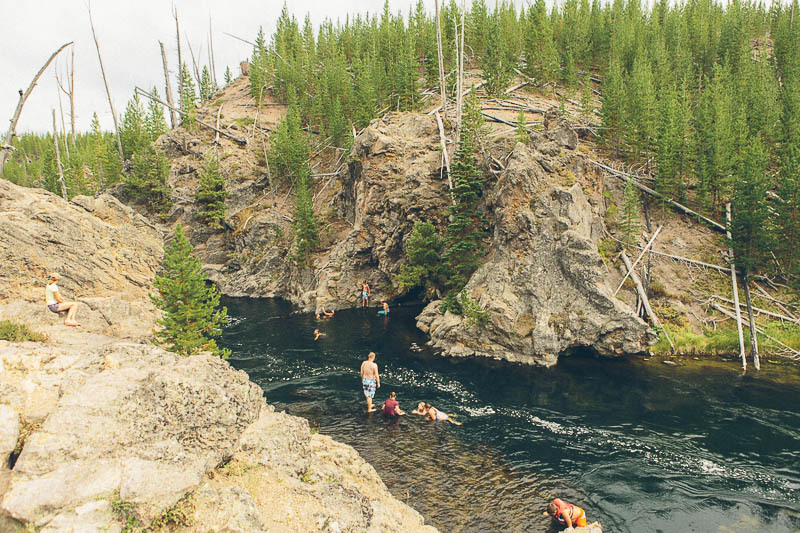 While most of the water in Yellowstone is too dangerously hot to swim in - it literally boils straight out of the ground - I found a popular swimming area in the Firehole River. 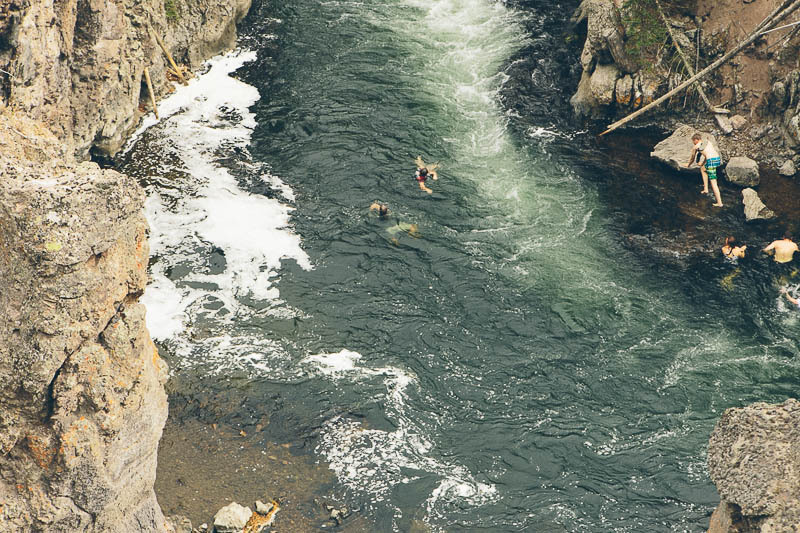 Located at the base of a canyon carved out by the river, the swimming hole was full of folks wading and swimming through the chilly water, doing their best to beat the summer heat. We swam around a bit, but threatening-looking storm clouds and our rumbling tummies sent us home earlier than we had hoped. As we drove back to the campground, we saw an inordinate number of cars pulled off to the side of the road. Curious, we pulled over, got out of the car and joined the group of camera-and-binocular-wielding tourists, who were all patiently staring the same direction. "Um…excuse me. What's going on?" I asked one. 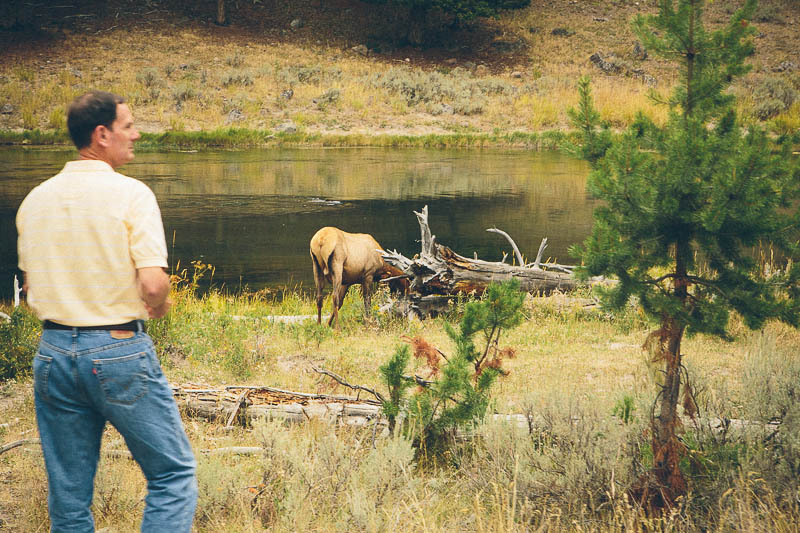 "Oh, I think there was an elk grazing about 200 yards that way, but it's gone now." they whispered back. Oh….wait, what? Seriously? Y'all all pulled over because there was an animal doing it's thing in the wilderness that it lives in? 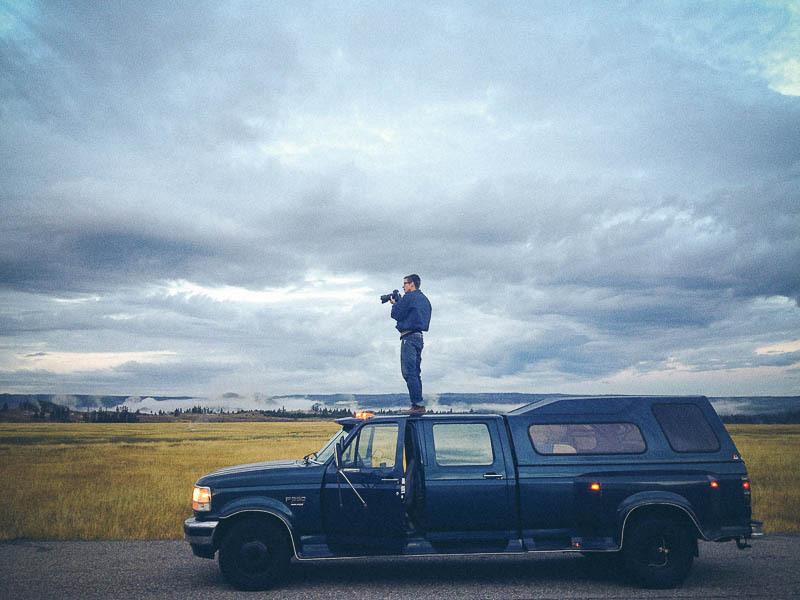 I don't mean to sound jaded - I think wild animals are beautiful - but there was something voyeuristic about the way people were searching for a glimpse of these animals through the lenses of their cameras. We're just as guilty though...I guess we all play the tourist at some point. 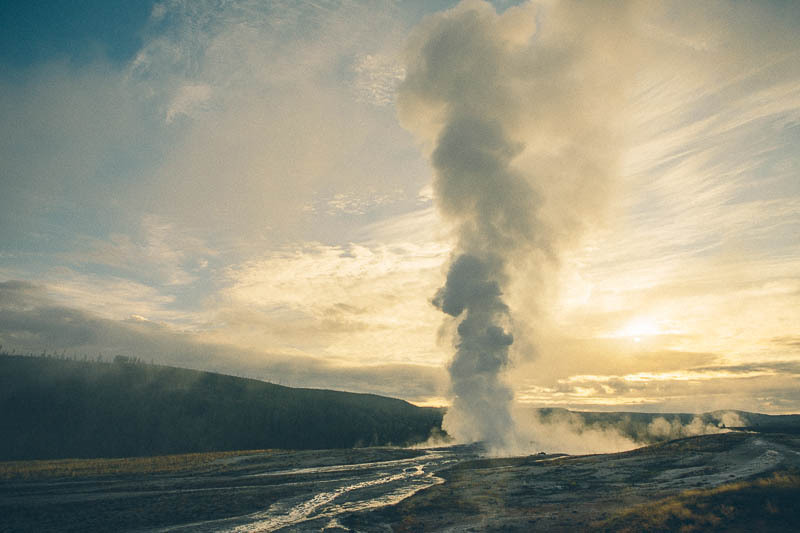 The next morning, we had plans to meet Leigh and Brian of Aluminarium to watch Old Faithful do it's thing at sunrise. We woke up well before the sun, poured coffee into our travel mugs and set off into the park. We had the road to ourselves and drove in silence, watching the settling fog mingle with the steam rising from the geysers. 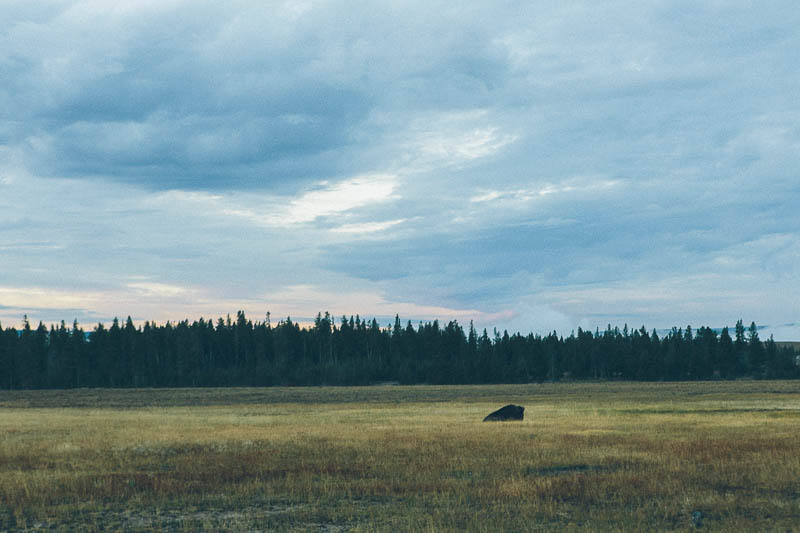 We saw herds of elk and slow-moving buffalo, relishing in the quiet stillness of the land. It was beautiful. It was how things should be - nature without the interference of humans. 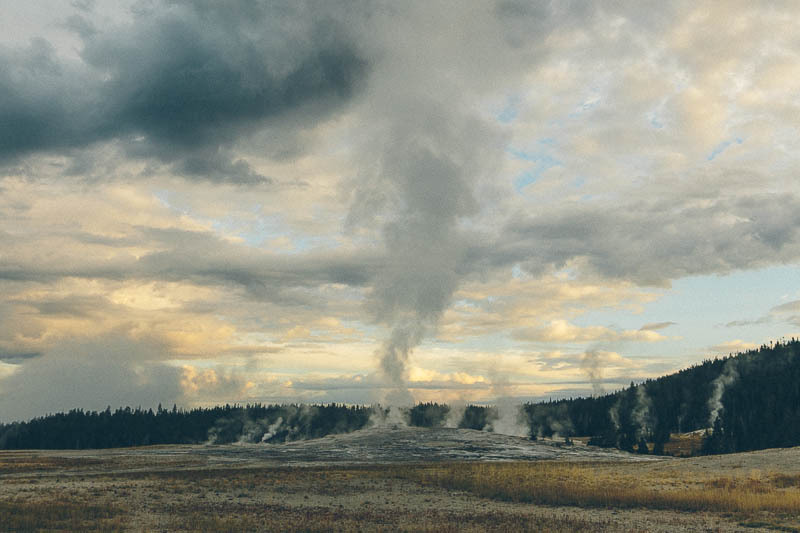 When we finally got to Old Faithful, we found that we had just missed the eruption. 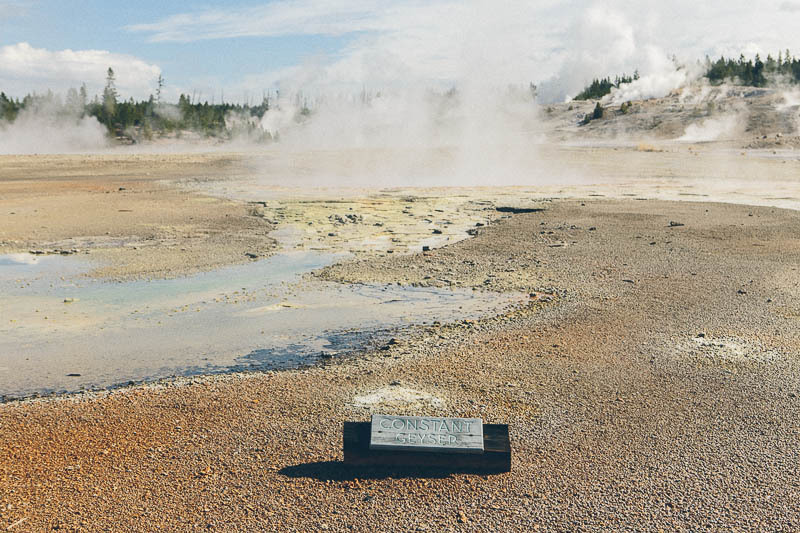 But Old Faithful is predictable: the famous geyser goes off about every 91 minutes and there's a clock that counts down to the next eruption. We patiently waited and were rewarded with an incredible show of steam and water shooting up over 100 feet into the air, backlit by the rising sun. The four of us spent the rest of the morning visiting the various geyser fields. 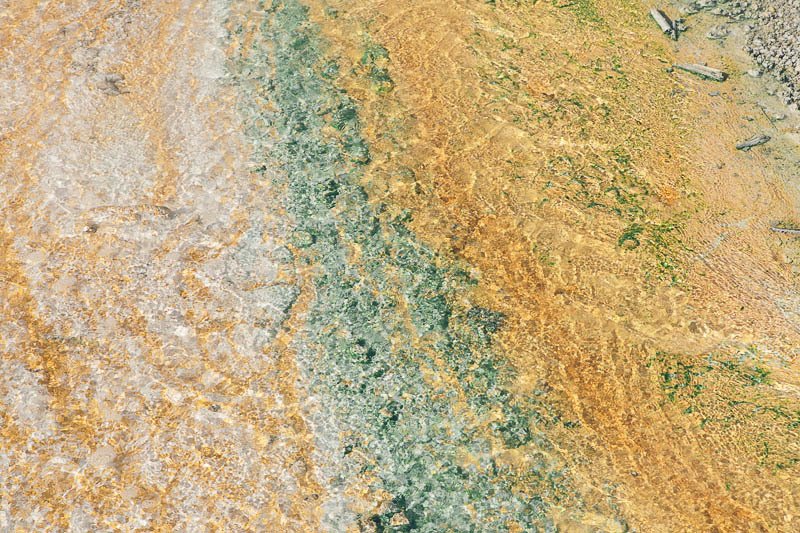 Because of the high temperatures and unstable ground, there's a raised boardwalk that winds through the basins, past bubbling and steaming pools of neon water. 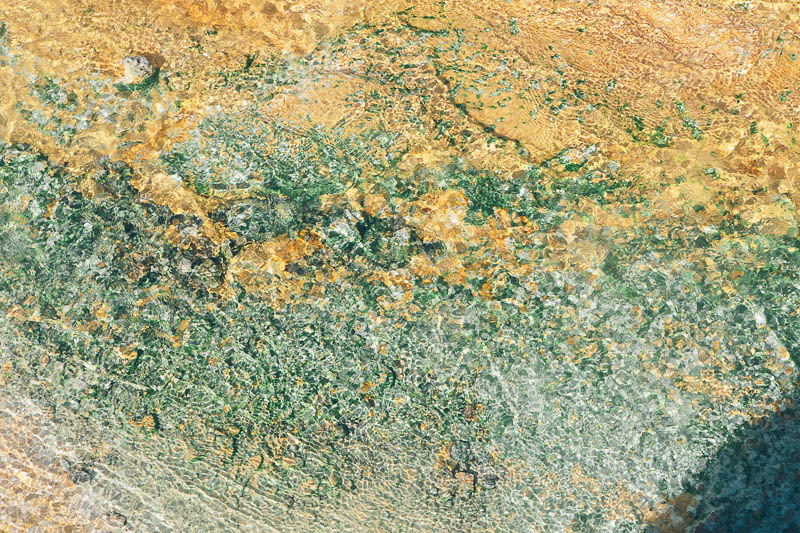 Plant life can't thrive in the extreme geothermal conditions, leaving the geyser fields bare and otherworldly. 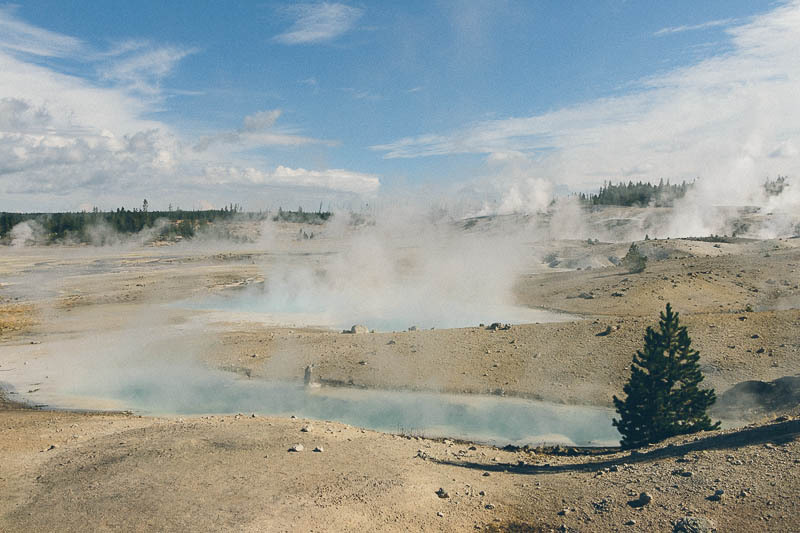 And the high levels of sulfur make those plumes of steam real, real stinky. 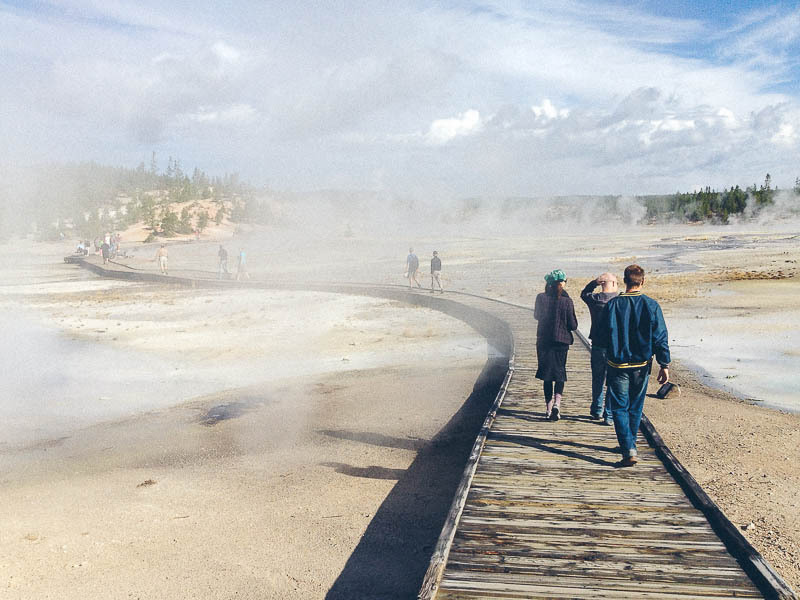 A small price to pay to walk among the largest concentration of geysers in the world. 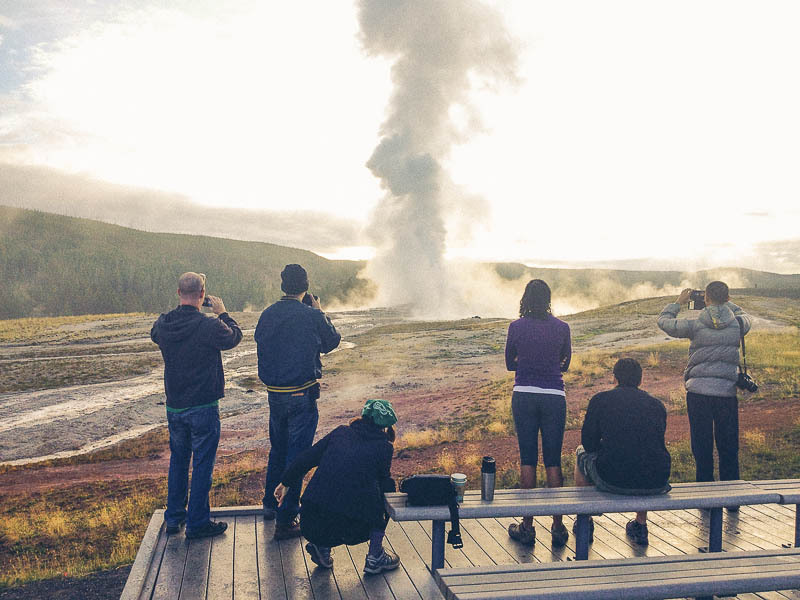 After getting our fill of crazy-looking, smelly, steamy geysers, we decided to head north towards the Grand Canyon of the Yellowstone and a few other must-sees. But John wasn't feeling so hot and after driving nearly an hour towards northern Yellowstone, we decided it would be better to turn back to camp. On our way home, I picked up the makings for some chicken noodle soup and we spent the afternoon eating homemade soup and snuggling in bed. Writing about our travels from months ago, especially our time spent in national parks, makes me realize that we don't spent enough time exploring some of the most special places in this country. Part of it is out of our obligations to work: we may be traveling full-time, but it's far from a full-time vacation. We have jobs and clients and that require a good WiFi signal (not always easy to find in remote national parks). Part of it is being forced to play tourist: snapping photographs at prescribed "scenic overlooks" that look exactly like the postcards they sell in the gift shop leaves a bad taste in my mouth. And part of it is that there's just so much of this darn country to see! If we spent weeks fully exploring every beautiful place in the United States, we would be traveling for the rest of our lives. And we'd never get any work done. But these are just excuses. 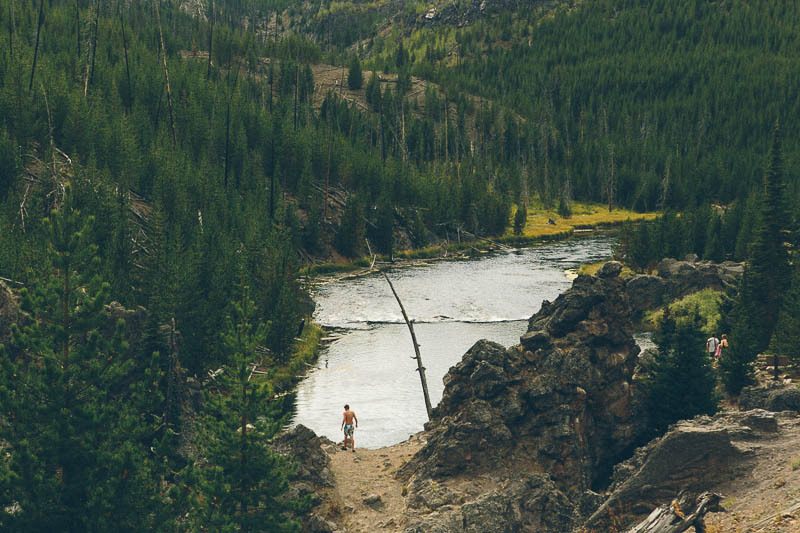 Now that we know where Yellowstone is and all the wonders it contains, we'll definitely be back. 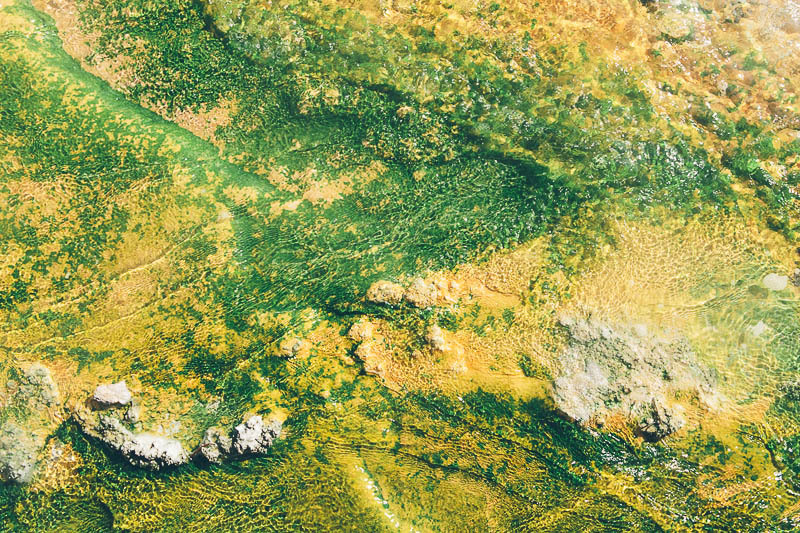 Special thanks to Allison (who suggested See the geysers and smell the sulfur! ) 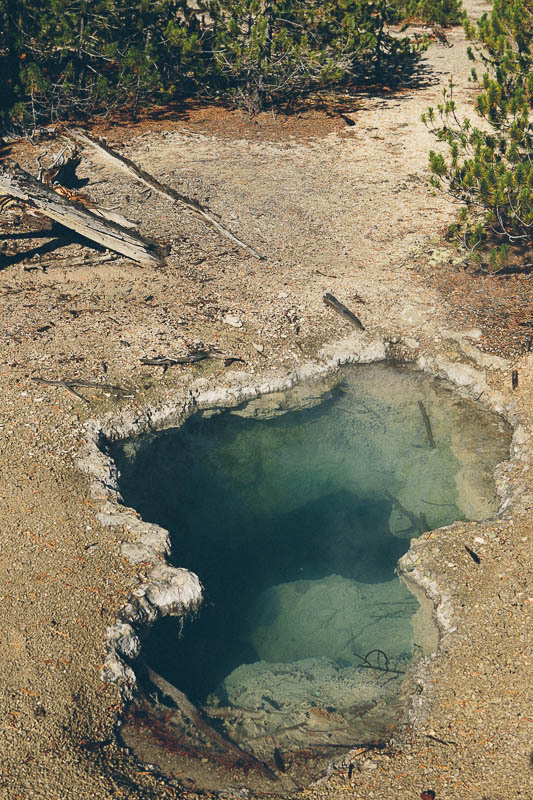 and Simon M. (who suggested Old Faithful, Hot Springs, Hike a ton, Learn how to avoid bears) for making this blog post possible!